'Secret Island Party' located on Zaya Nurai Island, Abu Dhabi on Friday 26th April 2019. Zaya Nurai Island is a private island in Abu Dhabi surrounded by natural beauty. One of the world's most incredible island resort's. With a number of packages to choose from all guest's can expect boat transport on and off the island, cocktail reception, 4 hour brunch package inclusive of food and beverages, pool and beach access on this surreal luxury private island, music from award winning DJ's and various entertainment throughout the entire day and night. Added extras will also be available such as Jet Ski rentals and access to the interactive surfing machine. 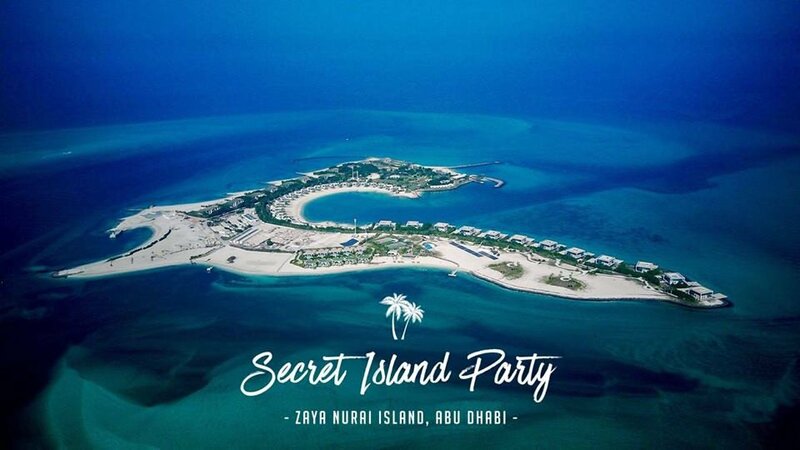 Secret Parties have partnered with Zaya Nurai Island to provide guests with the opportunity to stay overnight in the beautiful beach villas with options available for up to 10 people. Each luxury beach villa comes with it's own private pool and access to the private beach. The party will start at 12pm and will continue until 8pm. At this stage guest's will be transported via boats back onto the mainland or stay overnight in the luxury beach villas. Brunch passes to be purchased separately. Do not miss out on this amazing event, only 120 tickets available! Ticket's will be sent to guest's and will be required for access onto the island.